Snapping its two-day fall,gold price today soared by Rs 575 to Rs 31,625 per ten gram on fresh buying by stockists at current lower levels for the ongoing marriage season amid a firming global trend. Silver prices also shot up by Rs 790 to Rs 45,790 per kg on increased offtake by jewellery fabricators and industrial units. Traders said fresh buying by stockists at existing lower levels after the recent fall to meet the ongoing marriage season demand mainly pushed up the bullion prices. They said a firming global trend as the dollar weakened and lower prices spurred demand in China,the second-largest consumer,further fuelled the uptrend. Gold in Singapore,which normally sets price trend on the domestic front,rose by 0.6 per cent to USD 1,258.30 an ounce. In addition,some investors shifting their funds from weakening equity market to rising bullion also influenced the sentiment,they added. On the domestic front,gold of 99.9 and 99.5 per cent purity jumped up by Rs 575 each to Rs 31,625 and Rs 31,425 per ten gram,respectively. It had lost 550 in the previous two sessions. Sovereign followed suit and rose by Rs 100 to Rs 25,300 per piece of eight gram. 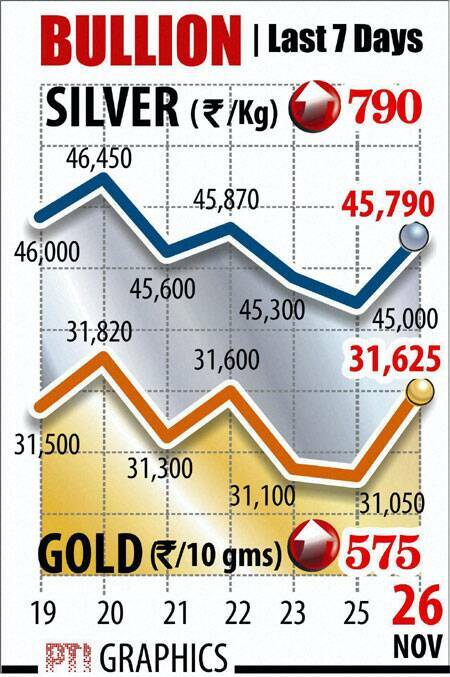 In a similar fashion,silver ready spurted by Rs 790 to Rs 45,790 per kg and weekly-based delivery by Rs 900 to Rs 44,990 per kg. The white metal had lost Rs 870 in last two trade. Silver coins flared up by Rs 1,000 to Rs 85,000 for buying and Rs 86,000 for selling of 100 pieces on upsurge in demand.